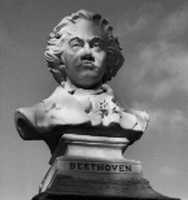 The sculptor Ferdinand von Miller (1842-1929) created this bust of Beethoven in 1884. It is situated near the Music Pavillon, with busts of other composers: Mozart, Rossini, Wagner, Gounod, Verdi. It is made from composite stone and its dimensions are: 2'3 high, 2' wide, 2' deep.